Bins will be placed throughout the Sweet Corn Festival grounds July 20-21. MOUNT GILEAD — Visitors of the Sweet Corn Festival, July 21-22, will have more opportunities to recycle thanks to a Keep America Beautiful/Coca-Cola Public Space Recycling Bin Grant. The festival will kick off with a ribbon cutting ceremony that will honor Morrow County Recycling/Keep Morrow County Beautiful for receiving a national competitive grant from Keep America Beautiful and The Coca-Cola Company that awarded the county 35 public recycling bins. Bins will be placed throughout the festival and will also be available free for other public events throughout the county. The goal, according to Lindsey Grimm, director of Morrow County Recycling/Keep Morrow County Beautiful, is to introduce recycling as an option at public events. In addition to the recycling bins at the festival, there will be two waste stations that will accept sweet corn husks and cobs for composting. The collected sweet corn debris will be recycled locally at the Renergy plant in Ashley. “It is our hope to break the trend of only being able to recycle in our homes,” said Grimm. “There is a growing recycling trend happening at the 12 recycling site locations found throughout Morrow County. 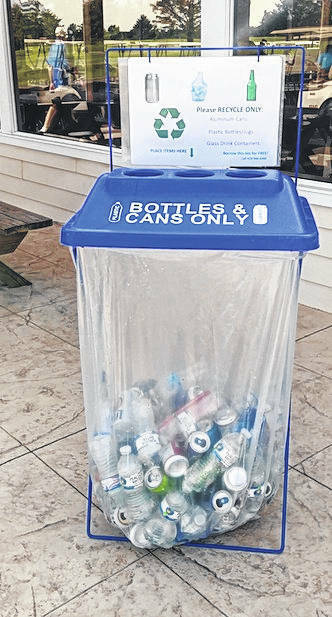 Hopefully, the trend will continue to become popular with events being hosted within the County.” The bins have been included at 11 public events this year with 190 pounds of plastic bottles and aluminum cans recycled. To reserve the recycling bins for your next public event, call 419-946-6400. Coca-Cola, with the help of the national nonprofit Keep America Beautiful and many other partners and communities across the country, reached a milestone this year. The company and its partners donated 1 million recycling bins to communities. As part of the 2017 Coca-Cola/ Keep America Beautiful Public Space Recycling Bin Grant cycle, 3,250 bins are currently being distributed to communities, including the 35 recycling bins awarded to Morrow County Recycling/Keep Morrow County Beautiful. The Coca-Cola Cola/Keep America Beautiful Public Space Recycling Bin Grant Program supports Coca-Cola’s newly announced “World without Waste” initiative, which aims to collect and recycle a bottle or can for every one the Company sells by 2030.